Are you also dreaming of a big bike tour? 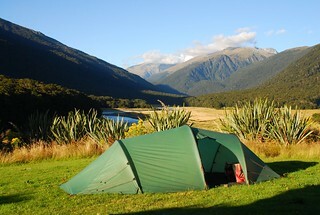 Then check out our Bike Touring Survival Guide. We wrote it after returning from our world trip, and we packed it with all the tips and advice we wished we’d known before leaving. 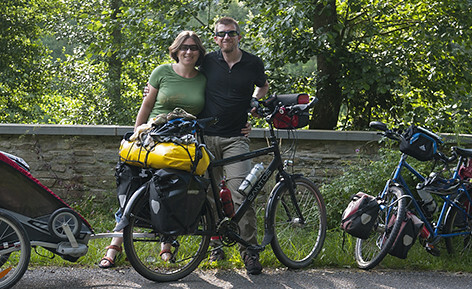 We’re Friedel & Andrew: two Canadians who love travelling by bicycle. So far, we’ve travelled through over 30 countries and cycled over 60,000km. Most of that distance was covered on a bike tour around the world from 2006-2009. We’ve also taken numerous shorter trips through places like Denmark, Spain and across our current home base – the Netherlands. In 2012, we (unofficially) became the Travelling Three with the birth of our son Luke. 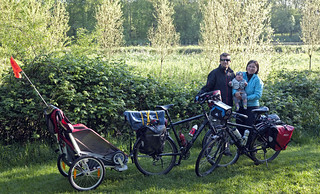 At the tender age of 5 months, he went on his first bike tour through the Netherlands, Belgium and France. When we first started bike touring, we had almost no cycling experience. We did have a couple bikes but they were in terrible shape (the brakes didn’t even work properly!) and we only used them for a short commute to work along flat bike paths. Ultimately, it was the desire to travel independently and to experience the ‘places inbetween’ that encouraged us to try bicycle touring. We started with a big dream – to bike around the world. Considering our lack of experience, this plan was a little ambitious but we reasoned that we could always trade in our bikes for backpacks, if it all went wrong. Thankfully it never came to that. We fell in love with cycling as a way of seeing the world and decided to start this website as a way of encouraging others to do the same. Our free newsletter is a great way of staying in touch with us and the latest website happenings. We pack it full of practical tips, and you’re welcome to read previous editions of the newsletter. 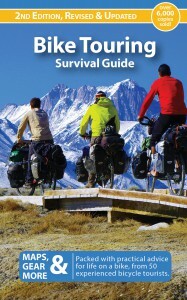 When you sign up, you’ll receive the first 45 pages of our Bike Touring Survival Guide book for free! Simply enter your email in the form below and we’ll send you a PDF copy. You can also join us on Facebook, Twitter or send us an email. We’ll answer as soon as we can but sometimes this takes a while, now that we have a baby. You may not reproduce text or photos without prior permission. Please ask first!